Have you heard about the new Spaghetti Gelato? Sounds odd doesn’t it? Well, to be quite honest, it is not as bad as you can imagine. Picture this, delicious creamy gelato in the form of spaghetti! Gelato is a delicious Italian desert, that is extremely rich in flavor and heaven for your taste buds. In Manhattan Beach, California, you can find a delicious gelato shop that will satisfy your sweet tooth needs. Gelato and Angels in Manhattan Beach is an incredible shop to stop at when you’re craving something sweet, or even after a walk from the Manhattan Beach Pier. Here, you will find a great selection of different gelato flavors such as; Nutella, Cookie Attack, Kit Kat, etc. As you are standing in front of over 30 different flavors of gelato, best believe that no matter what flavor you choose, you will be incredibly satisfied. As I said before, Spaghetti Gelato is a unique way to have your gelato served to you. You can walk in and ask for the spaghetti style gelato. Here, you will tell them what flavor you will want to be your spaghetti, and from there you will be able to add the different toppings you desire to make it look more like a plate of spaghetti. In other words, your ice cream will be put in a machine that will convert it to become spaghetti-like noodles. This creamy delight is incredibly delicious and will melt in your mouth in an instant. 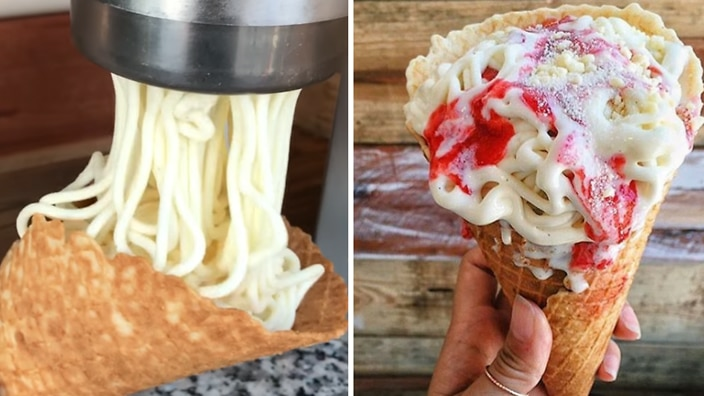 As you get your gelato spaghetti, you will have to make sue to have extra napkins, since it will melt in your mouth due to the creamy deliciousness involved in the process. Overall, you will not leave with a low expectation, because Gelato and Angels will not let you down with their incredible creations. Have you heard of that delicious sweet desert that is also known as Dragon’s Breath ice cream? Here in the area of Los Angeles, California, you can visit the Chocolate Chair. The Chocolate Chair is a well known place for their liquid nitrogen ice cream known as, Dragon’s Breath. This sweet delight is a delicious ice cream that will allow you to get the effect of a frosty breath as you eat it. If you really want to know what is truly tastes like, feel free to try it out on your own free time, but it does have a cereal-like flavor. Although the cereal-like flavor may not catch your attention, the amazing frosty effect will catch your attention once you are seeing it in person and experiencing it. « Wurstküche ? Hot Dogs? Fries?